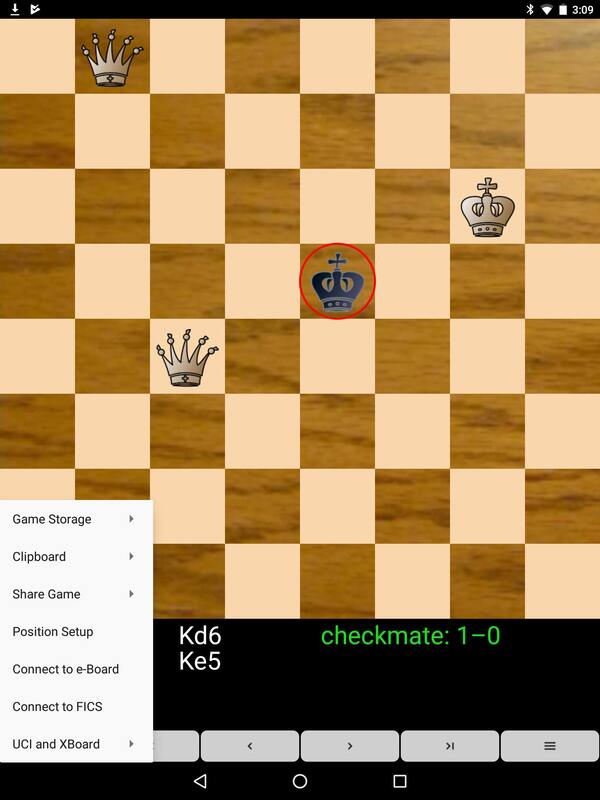 I am gradually rolling out version 6.1.1 of Chess for Android to Google Play. The FICS interface is simple, in line with the design philosophy I have been following so far. Nevertheless, the client is fully functional, and I have started to enjoy playing over an actual chess board with people online myself. A big thank you to my testers! Writing a client from scratch is a non-trivial task, and they were extremely helpful during the initial development. Any remaining bugs are mine, of course. Please send me the details if you find one. I went to the web page and liked what i saw and had it delivered to my Nexus 9 for when next on tablet. Nice to see you use the Monge pieces. I know of 5 sets so far and like for chess the fantasy and spatial sets. I see you have the fantasy set and eyes. I've used all three of fantasy spatial and eyes in my apps. I see you have a million plus installs. That is more than chess - analyze this and droidfish. What is your secret? I went to your website, and noticed that your story and my story for getting interested in computers and computer chess are very similar! I am thrilled to see so many high quality chess programs on Android nowadays! Thanks for implementing Pulsar! Did you consider making it OEX compatible (the classic chess part at least) so it can be imported in other GUIs, just to exploit the Android chess ecosystem to its fullest? Did you consider making it OEX compatible (the classic chess part at least) so it can be imported in other GUIs, just to exploit the Android chess ecosystem to its fullest? I considered it. There are two reasons i'm not doing it now. One pulsar on android is kind of a port with some new gui code and some backend code translated to java of my iOS pulsar started in 2014 https://itunes.apple.com/us/app/pulsar- ... 40447?mt=8 and the engine is designed to be integrated in the app in how it's run and handicapped. Now i could just go ahead and make a pulsar binary anyway but I wanted to give pulsar chess a monopoly for a year or two. I'm currently actually doing a big upgrade to get open pgn so it can open its log file and engine analysis in wild 0. I"m porting the code from my two OpeningTree apps on iOS and android my most popular chess app. Pulsar will only open its log file right now which currently can only be exported out and engine analysis will use stockfish on android and crafty on iOS like the OpeningTree apps. The variant market is not as large and i'm trying to position it as a full featured regular chess program. But after i've done my year or two maybe i'll release pulsar for anyone. Still impressed you got a million installs. and 100K reviews. 4 stars not bad over 100k, Well i released Pulsar on android mid January this year and OpeningTree end of February and Pulsar has hit 500+ installs now and openingtree 1000+. Openingtree is the one really growing in active installs with about 900 active installs now compared to pulsars 200. So maybe with more work i can get pulsar growing again. One thing i noticed is its a limited now to a play a game online interface. Now simple works and i know you said you wanted to keep it simple. Still for members of FICS who don't choose guest a possible thing to do is a few more features. Maybe a simple console popup that just dumps all FICS text into text view with scrolling with a typing area below for commands so that users could unlock more of FICS while still keeping it simple. However i like what you got now. It's going to be great for your users. A basic way to get quick games at a time control. I may try something like that. Well the game isn't completely shown in this case without showing the UI I used, the app, Chess for Android. The pieces are Monge's Fantasy but otherwise i think its default. The menu appears on long press on board. When connected users get popups for incoming seeks , yes no, till they disconnect or play. Users can set the formula in connect to use for this. Still for members of FICS who don't choose guest a possible thing to do is a few more features. Maybe a simple console popup that just dumps all FICS text into text view with scrolling with a typing area below for commands so that users could unlock more of FICS while still keeping it simple. However i like what you got now. It's going to be great for your users. A basic way to get quick games at a time control. I may try something like that. Thanks! I actually started with a slightly more elaborate design (separate seek setup window and reply dialog windows for accepting one of the matching requests from a list), but then reduced that interface even more so that, after setting up the required time control and other parameters, game play becomes quick: simply accept/reject each next request and focus only on the games! I can't call myself a heavy online chess player yet, but that is the kind of environment I enjoy while on the mobile device. But that is not to say I won't add more features later based on the experience of more serious players! That is how i started computer chess. From your website I see you play 8x8 checkers too. Just curious, can you beat my Checkers for Android app? The engine in my chess app (stripped down BikJump) is of course rather mediocre, especially in this forum, but hopefully compensated by the other features of this app. But the engine in my checkers app (called BikMove) came out surprisingly strong, especially since I combined it with some self-brewed built-in endgame tablebases for only a few pieces. You got to give me some time. I haven't played checkers in awhile. I think i'm going to do your play online only a game interface for my pulsar app on ios at first. "Connect to ICC". I'm doing engine analysis and open the PGN log file now. Things i'm porting from OpeningTree and adopting. But we will also do pulsar engine analysis in variants. Not many checkers players on icc but is playable online as wild 30.